We went to see the movie Chef last night and I loved it! Now I want a food truck! It got me thinking… if I had a food truck, what would I serve? Tacos, Cuban sandwiches, BBQ, crepes? Nah, definitely not crepes, but Mexican food is a possibility. Alan would want me to have a meatball truck. Just meatballs, I know it. I’d need a partner, anyone interested? If I could do it all over again, I’d go to culinary school, but alas I think that ship has sailed. Feeding my family and eating lots of awesome food is my destiny. Not a bad rap if you ask me, but the movie will certainly get my fellow foodies wanting to jump in their kitchens and cook. There’s always something new to learn about food. New techniques and recipes, I even get excited finding a new vegetable at the farmers market. I’m anxiously waiting for this seasons crops to teach me something new. If I had to pick one challenge in the kitchen, it would be cooking meat to the right temperature. I’m never confident it’s cooked properly. I own (what I think is) the best instant read thermometer, the Thermapen. If you don’t own one, you should. It takes the guess-work out of cooking any meat to the perfect doneness. Just stick the probe in the meat and it instantly gives you a reading. Fantastic! Many of the instant read thermometers say they’re instant, but they’re not. This is especially important when checking the temperature of foods on the grill. Reducing the time your arm spends hovering over the open flames, a Thermapen can save your arm hairs that’s for sure. I like my steak rare-plus. That’s somewhere between rare and medium-rare. Alan likes his steak medium-well. Oy! When we first met he liked it gray and dry inside. His steak eating has developed nicely over the last decade and now he will eat it a little pink. I’d say that’s progress. There are many helpful guides available for how to cook the perfect steak and everyone has a theory. I say follow these steps and your steak will be delicious. I should preface that I’m not referring to London broil, flank steak or other larger cuts of meat. Think NY steak, rib-eye, porterhouse and if you must, filet. Buy the best quality meat you can afford. I buy my steaks at None Such Farms, locally raised and hormone free. Buy thick cut steaks. It’s difficult to cook a juicy, flavorful steak with a nice char when the meat is too thin. 1 1/2 inches is great. 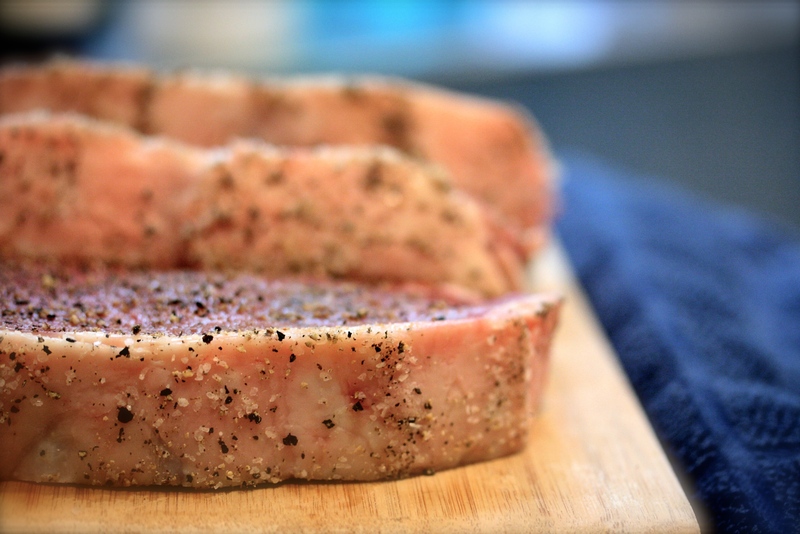 Season your steaks liberally with kosher salt and fresh cracked pepper on both sides. Put the seasoned steaks on a plate or better yet, on a rack in the refrigerator, uncovered for a few hours. Take the steaks out of the fridge about an hour before you’re going to cook them and let them come to room temperature. No matter how you like to cook your steaks – grilling, pan searing, broiling… get a thermometer to check if they’re done, whatever you do, don’t cut into the meat to check! When it’s done, let it rest. 5 minutes is great. We also have one more rule in our house. NY Strip Steaks only! If I could get Alan to eat his meat even medium-rare, I’d welcome a nice big porterhouse to share on our table too. 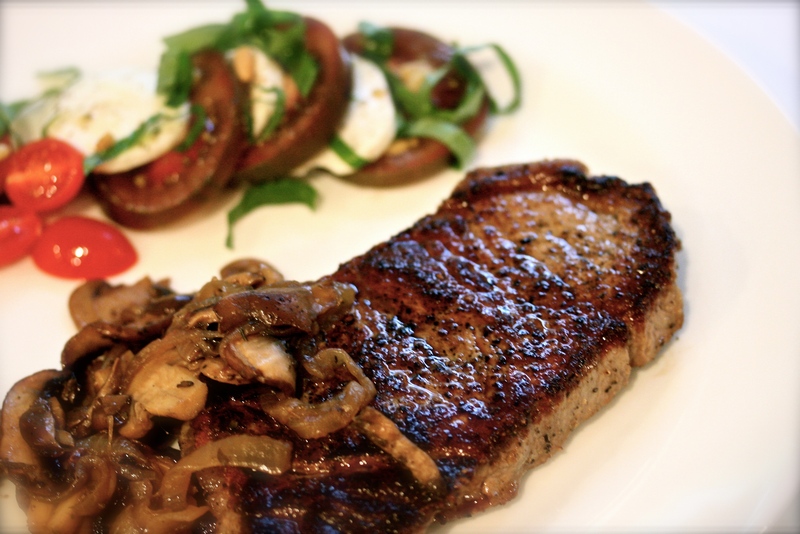 We love sautéed mushrooms with a big steak. Here’s how I make them. Add the olive oil to a large fry pan set on medium-high heat. Saute the onions until they are translucent and begin to turn a little golden on the edges. 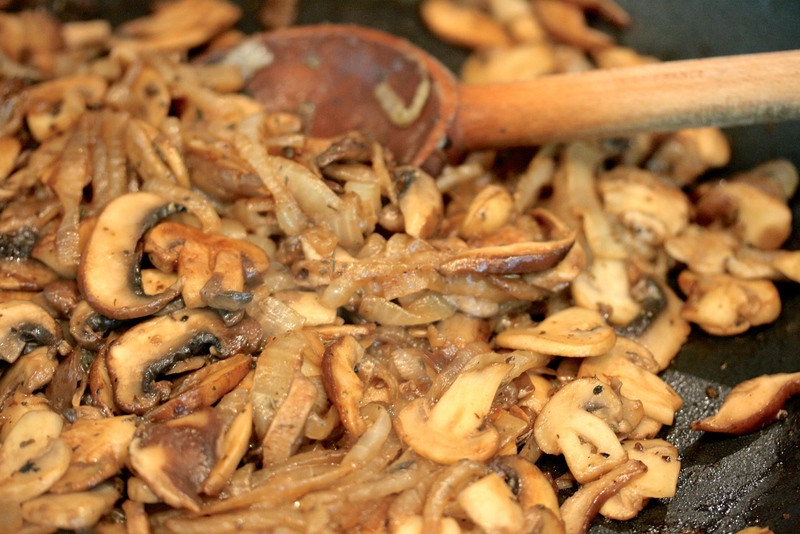 Add the sliced mushrooms to the pan and stir. Cook, stirring occasionally until the mushrooms release their juices, about 5-7 minutes. 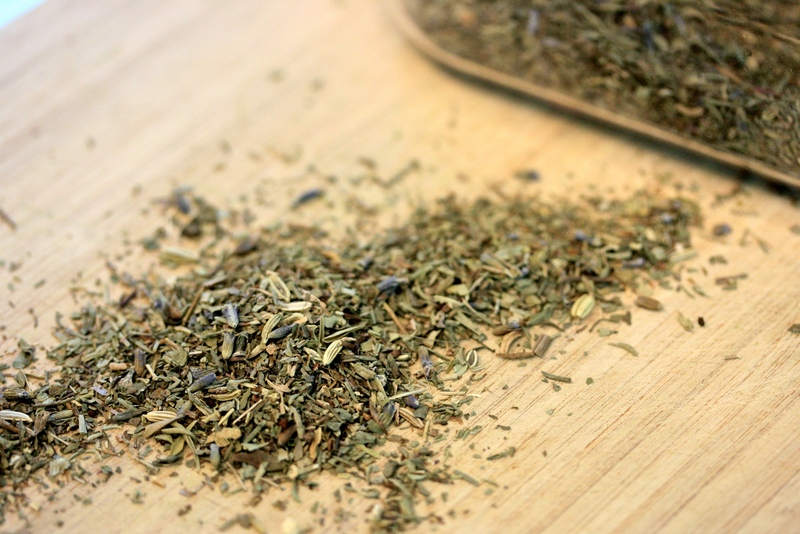 Raise the heat slightly and add the salt, pepper and herbes de Provence. 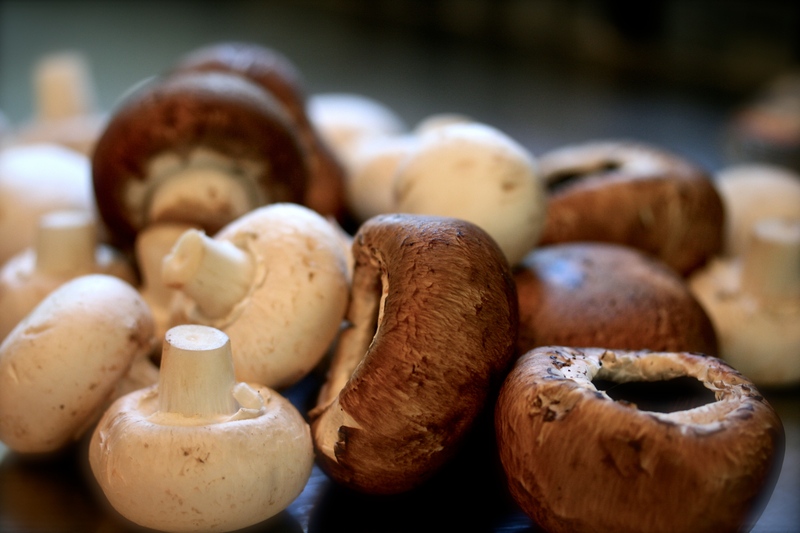 Continue cooking until the mushrooms brown and the liquid disappears, about 10-12 minutes longer. Add the balsamic vinegar and stir to combine. Remove from the heat and set aside while you cook your steaks. Sprinkle both sides of each steak liberally with the salt & pepper and a pinch of garlic powder. I like to coat the fatty edge of the steak in the seasoning as well. I’ll admit I like the burnt edges of the crispy steak fat, sinful. Place on a plate and put in the refrigerator for a few hours, uncovered. Even overnight is fine. 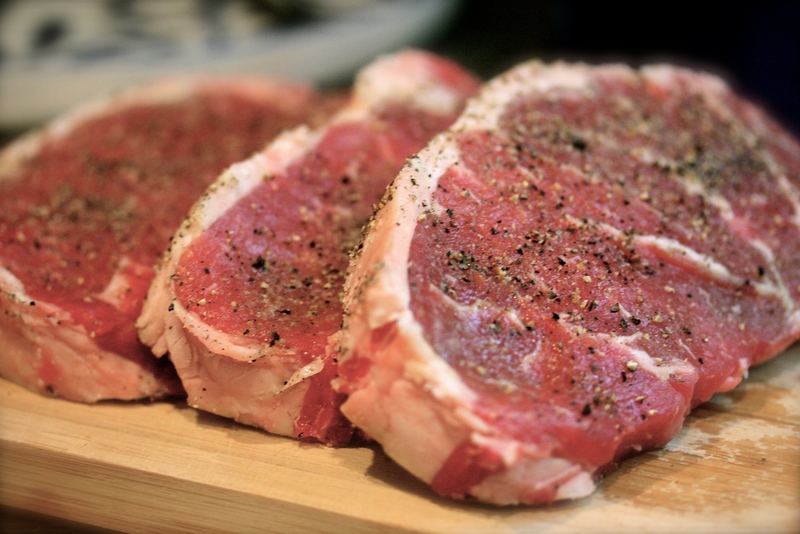 Remove the steaks from the fridge about an hour before you want to cook them. Heat a skillet or sauté pan (not non-stick) on high heat until it’s screaming hot, add a few tablespoons of olive oil. Sear the steaks in the hot pan for 3 minutes and then flip. Continue cooking until they reach your desired temperature. Let the steaks rest on a plate for 5 minutes tented with foil, to allow the juices to absorb back into the meat. If you cut them too soon, the juices will all run out of the steaks and you won’t have a juicy piece of meat. 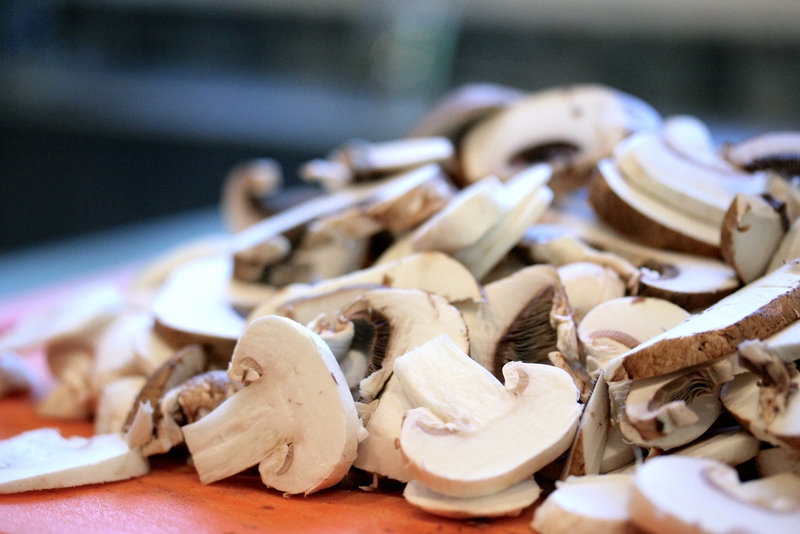 Serve with the mushrooms and onions on the side. STEAK TEMPERATURES: 125 degrees for rare, 130 degrees for medium-rare, 140 for medium and 150 for Alan’s medium-well. A few seconds can make all the difference so keep a watchful eye on your steaks and most importantly, don’t forget to enjoy nice glass of red wine with that awesome piece of meat! Made pan grilled steaks tonight too!!! I made rib eye. Our family is w/ Alan – just a lil pink in middle is how we like it. Wouldn’t that be awesome?! You need to go see the movie, you’ll love it! There are great online classes from the CIA. You can get most of culinary school at home. Just keep cooking. It is never too late. Culinary school is great but way too expensive for what cooks are paid when they get out of school with Law School sized loans. Buy the CIA Professional Chef book and work your way through it. I’ll definitely look for it. It would be a fun, stress-free way to learn more that’s for sure.